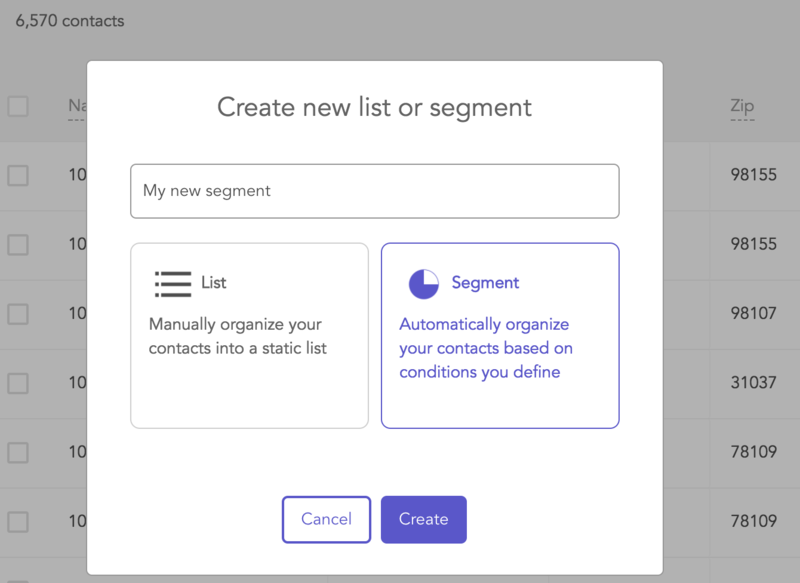 Segmentation is a powerful tool to create precisely targeted mailings lists by filtering your contacts into auto-updating lists called segments. Imagine being able to create personalized campaigns to your contacts that are best suited for the message you're sending them. Well, that's what you can do with segments! All contacts who live in the zip code 94105. All contacts who live in San Francisco or New York City. All contacts who you've never mailed. All contacts who were added to your VIP list since September 15th. Segments are created based on conditions you set. Example conditions are things like "List membership", "City", and "Mailed count". Mailjoy offers loads of conditions to use in your segments. We think you'll have a blast experimenting with all the ways you can use segmentation. Read about all the segment conditions here. Segments and lists are both ways to organize your contacts into more precisely defined mailing lists. 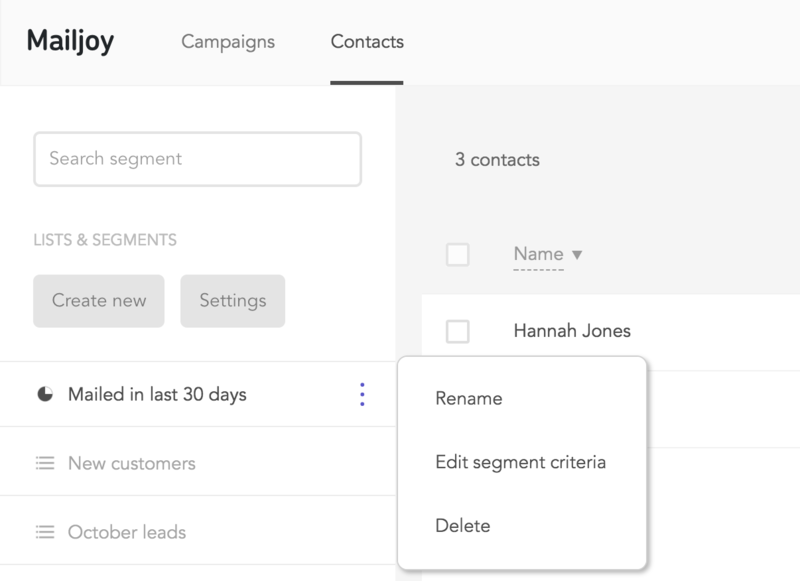 Segments are dynamically created and will continue to change who's in the segment as you add/remove contacts or change the criteria. Lists on the other hand, are static. You have to manually add and remove contacts. Lists and segments can even be used together. You could use lists to manually group contacts (i.e. VIP customers). and then use segments to hone that list further (i.e All contacts in the VIP customers list who live in San Francisco). 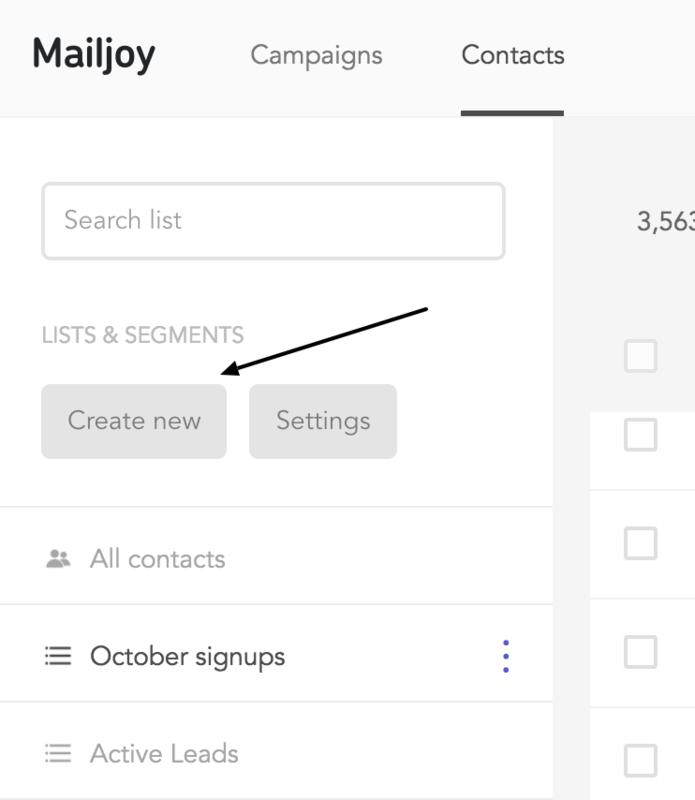 Unlike lists, segments can only be created on the Contacts page. To create one, click Create new in the left panel. You'll now see a modal where you can enter the name of your new segment. From here, you can start defining the conditions of your segment. When you're done, click save. 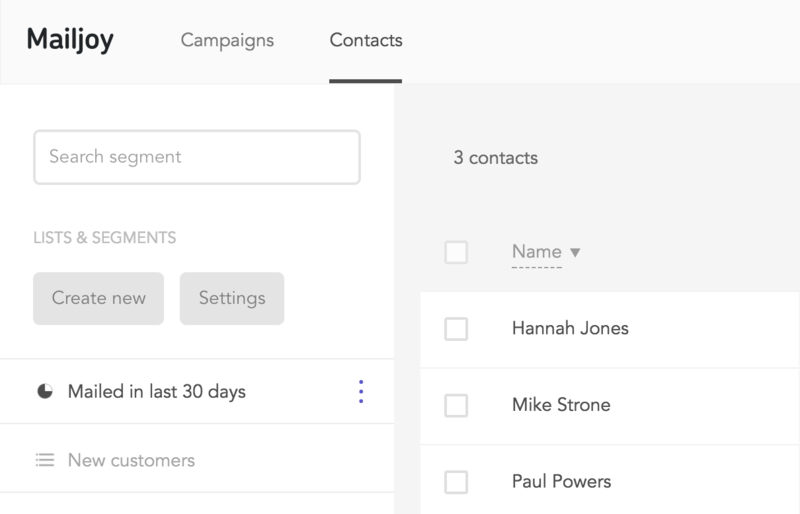 Not long after, you'll get to see all the contacts that match your segment's criteria. To see who's in a segment and manage it, simply select it from the left panel within the contacts page. This will filter your contacts to only the ones in that segment. If you want to manage the segment's properties like changing its criteria or deleting it, click the three purple dots that now appear next to the segment's name. When creating a targeted mail campaign, you'll have to choose a mailing list. This can be all of your contacts, a specific list of your choosing, or a segment. When a segment is used in a campaign, the number of mailers you will pay for and send is dependent on the number of contacts in the segment. This means if your segment grows or shrinks before you order, the number of mailers you send will adjust accordingly. When you delete a segment, the contacts within them are not deleted. They're simply not in that segment anymore because it no longer exists.